This International award winning glass mirrored heating radiator is shown here as a bathroom towel rail, but can also be used as a conventional panel radiator. This German quality electrical heating radiator is made of 13mm mirrored glass with the heating elements invisibly built into. All mirror heating radiators can be thermostatically controlled via a remote control heating thermostat, this is available as an optional extra. 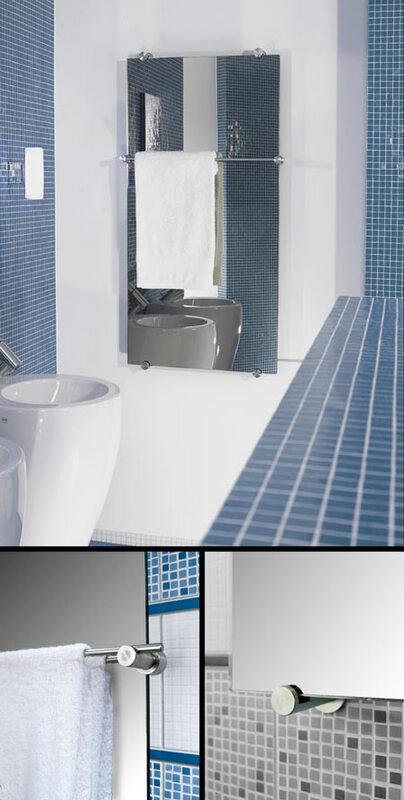 All heated mirrors will give condensation free viewing in steamy bathrooms. "Latest German Technology and Design"
* Mirror glass and stainless steel.